Are you a current AWS user? Worked for Barneys 23 Years! 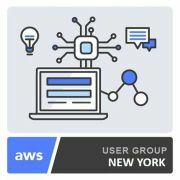 Welcome to the official Amazon Web Services (AWS) New York Meetup. Founded and organized by AWS employees, we'll explore all aspects of working with AWS. Learn about new services and features, hear from AWS customers who are using our services in new and exciting ways, learn how to partner with AWS and enjoy the company of others who are eager to share experiences.